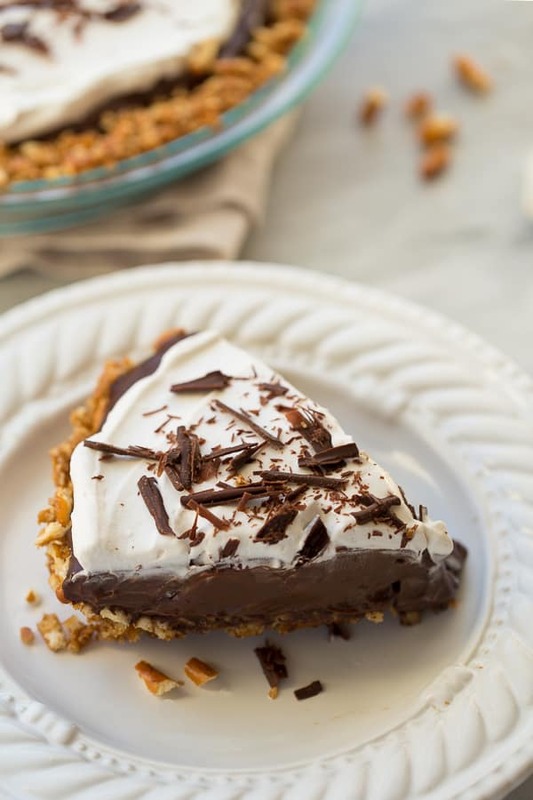 Gluten-Free VEGAN chocolate pudding pretzel pie! Nobody will guess this amazing dessert is dairy-free! I made a version of this pie last year for Christmas Eve dessert and OH MY! Even amongst the sugar cookies, candy and fudge at Christmas time, this dessert stood out as a one of the best things I’d eaten during the holidays. If you’re searching for the perfect dairy-free, gluten-free holiday dessert – this is it! 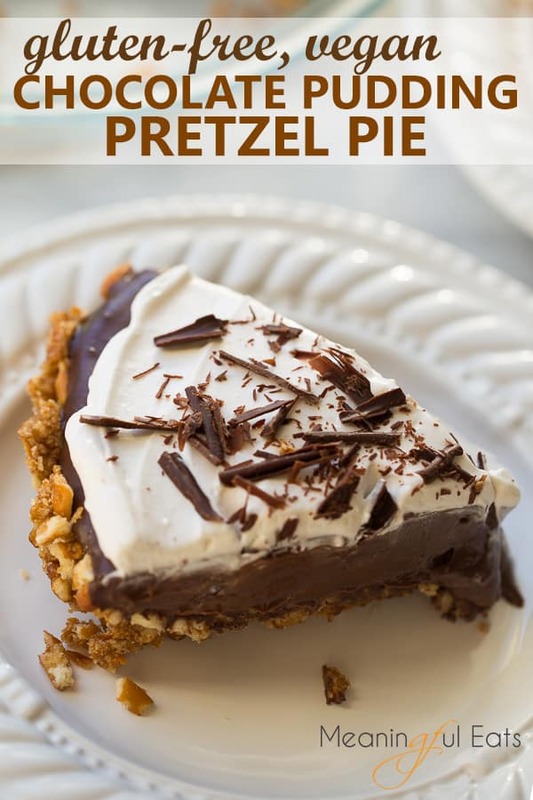 This chocolate pudding pretzel pie is perfect for Thanksgiving or any time you want to make a special dessert for someone with food allergies. I love this pie so much I would have it for my birthday instead of cake! This pie is also great because it is made with easy-to-find ingredients and has one of the simplest crusts around. Think as easy as graham cracker crust, but with salty pretzels. I love the sweet and salty combination going on in this pie! I originally made this with a chocolate pudding made with milk. However, I can’t eat very much dairy (and feel best when I don’t eat it at all) so it was time to find a real-deal vegan chocolate pudding. I’m happy to report this vegan chocolate pudding tastes just like the real thing! This vegan chocolate pudding doesn’t have any avocado, banana or tofu like other vegan chocolate puddings, but rather is made on the stove with milk, cornstarch (or arrowroot), and sugar just like traditional pudding. I could eat it in a bowl topped with my favorite So Delicious Dairy-Free Cocowhip all on it’s own. What are your favorite pies to make for Thanksgiving? I hope you and your dairy-free guests love this pie as much as we do! Preheat the oven to 350F. Lightly grease a 9-inch pie pan with cooking spray. Place the pretzels in a ziploc and crush into very small pieces. Pour into a bowl and add the brown sugar and vegan butter. Stir to combine. Pour into the prepared pan and press into an even layer. Bake for 10-12 minutes until toasted. Let cool for 15-20 minutes before filling. In a heavy-bottomed saucepan, whisk together the cocoa powder, cornstarch, cane sugar and pinch of salt. Over medium heat while whisking, add the coconut milk and almond milk. Whisk until totally smooth. Continue to whisk until the mixture comes to a gentle boil. One the mixture bubbles continue to whisk and cook for another 2 minutes until thick. Remove from the heat and stir in the chocolate chips, vanilla, and vegan butter (if using). Pour into a bowl and let cool to just about room temperature, stirring often. Melt the chocolate and coconut oil together in the microwave at 50% power for 30-45 seconds, stopping to stir every 15 seconds. Stir until totally smooth. Pour and spread over the bottom of the prepared crust. Let set slightly before adding the pudding. Pour the pudding into the crust. Smooth, then refrigerate until set, about 2 hour or up to 12 hours. For the topping, place the CocoWhip in a bowl and use a hand mixer to whip until smooth, about 10-20 seconds. 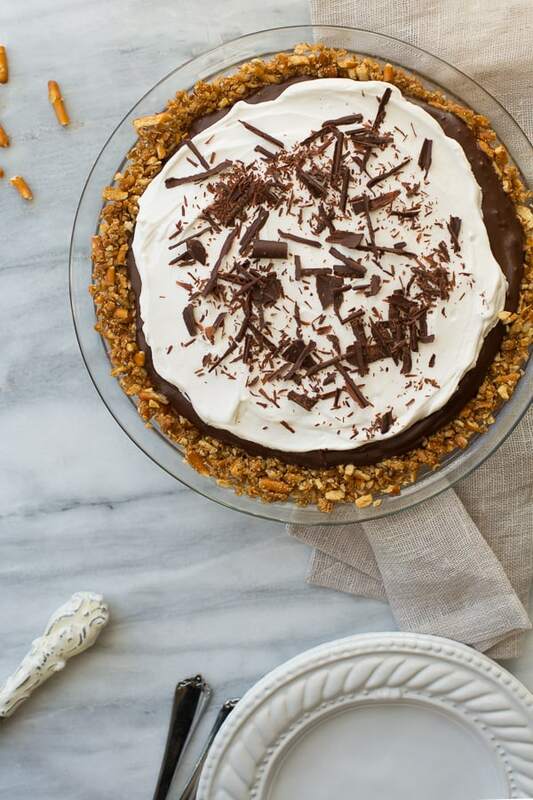 Spread over the pie and garnish with chocolate curls. Serve and enjoy! This post contains affiliate links to my favorite products. 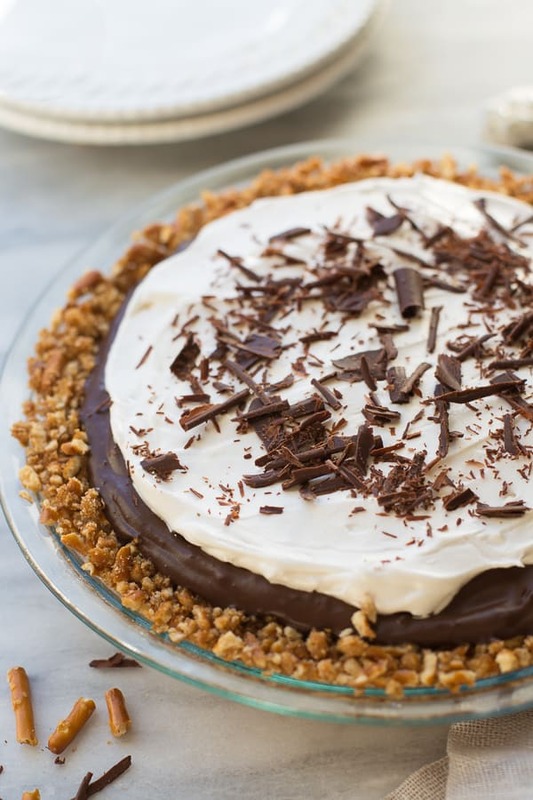 This Gluten-Free Peanut Butter Pie from Gluten-Free on Shoestring also looks delicious! 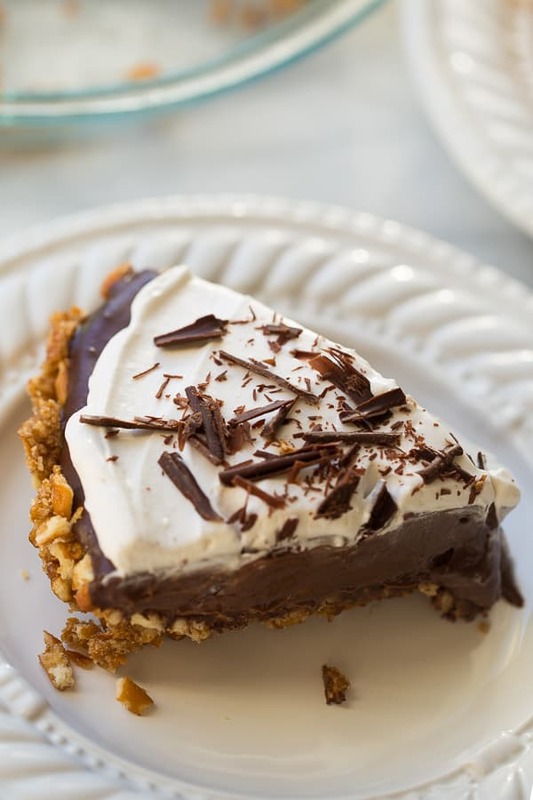 This No-Bake Dirt Pie from Cotter Crunch is also Vegan and Gluten-Free and looks fabulous. I make peanut butter pie with a pretzel crust but pairing it with chocolate is also genius! LOVE this! MMMmmmmmmmmmmmmmmmmmmmm. Is that enough of an indication of yummines? Looks super delish! What a lovely dessert! Perfect way to end any meal! Does this have a coconut taste to it in the chocolate? since you are using coconut milk, wondering as we don’t really like coconut but it make is dairy free and was hoping the chocolate flavor masked some of it. I don’t think this has a coconut taste! The cocoa butter makes it taste more like white chocolate if anything. And you can easily use peanut oil in place of the coconut oil. Let me know if you have any other questions! I was reading through these comments and realized I totally responded to this comment thinking it was on my Vegan Chocolate Peanut Butter Ice Cream Post! That must have been so confusing – so sorry about that! I don’t think this pie tastes coconutty. I think the chocolate covers up any coconut flavor for sure! Apologies for the mistake! Could regular (boxed) coconut milk be substituted for the almond milk? It’s not “nut free” as stated at the top of almond milk is used! Thanks for catching that! Yes boxed coconut milk will work great. I meant to add that to the notes. I’ve updated the recipe! How long will this be good for? I’m thinking about making it a day or 2 in advance. Thanks! Hi Jacqui! Unfortunately the crust will get soggy if you make it too far in advance. I wouldn’t make it more than a day in advance. 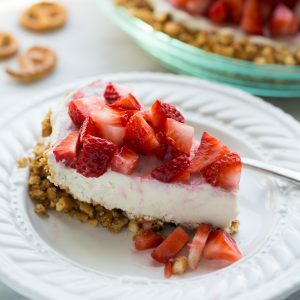 I love everything about this, but that pretzel crust is calling my name! Im going to make this for a work party on Monday! Hooray! I hope you like it! Erin, so glad I found your site! 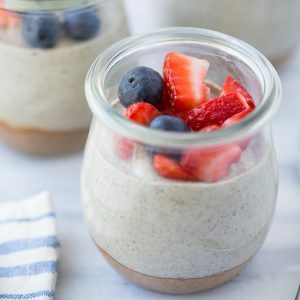 My daughter is allergic to wheat, eggs, milk, and nuts, so this recipe is PERFECT for her! I made this pie for Christmas dinner. It’s ridiculously good! I’ll make it again and again. Amazing. Thanks so much for the recipe! I could see making the pudding layer all on it’s own too, just for a stand-alone chocolate pudding. 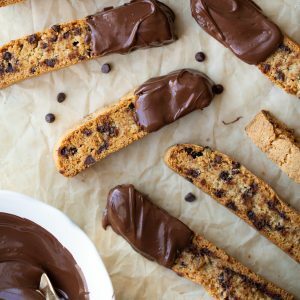 I was thinking about making this recipe as bars and was wondering if you have ever tried doing that. I’ve made it as a pie and it is amazing and would hope it would turn out the same way. Since I need to make it for more people, I thought this would be a good option. Please let me know your thoughts! This looks fantastic. Can you also use store bought already made pudding? We had a vegan, two celiacs, and a dairy and peanut allergy at our Canadian Thanksgiving celebrations this year. Finding recipes that work for everyone is so hard! This pie was amazing, and everyone in our family loved it! Thanks for the great recipe! I’m so happy to hear this! It is one of our very favorites too! Is there anything to substitute for coconut? I can’t have coconut. Any substituion suggestions? You could try using all almond milk! Do you have to chill the canned coconut milk? I made this for Thanksgiving and it pleased the vegans and non vegans, it was the first pie gone. It is already being requested for next year. Plus I am having it for my birthday! Love it! I want to prepare this using dairy. Is there a conversion for the milk that I should follow? Hi! Just wondering if you can bake the crust in advance and freeze to fill later. Thanks! Hi, would coconut oil work as a substitute for vegan butter for the crust? Thanks in advance! Yes that should work great! That won’t work unfortunately! The pudding would get runny as it thawed. Erin my love, when you say don’t use boxed coconut milk, you’re referring to the beverage variety, correct? Because i have boxed coconut cream from my local Asian grocery and i use it in place of canned coconut milk in nearly everything else. It’s the stuff in the small waxed boxes, like a box of tofu size. Also, have you tried this with a sugar replacement like stevia? Just curious! Thanks! Yes that is exactly what I mean! Don’t use the refrigerated beverage kind. The kind from the Asian market should work great! Also I haven’t tried stevia. I’m worried the pudding won’t set up correctly without the sugar! How far ahead can I make this? I’m planning on going to a barbecue tomorrow afternoon. If I make it this afternoon, will the pretzel crust be soggy 24 hours later? Thanks! Could u substitute lactose free milk for the coconut and almond milks? I haven’t tried that so I’m not sure! This is our family FAVORITE! seriously! I love chocolate pudding pie and this one has just enough salty to the sweet.